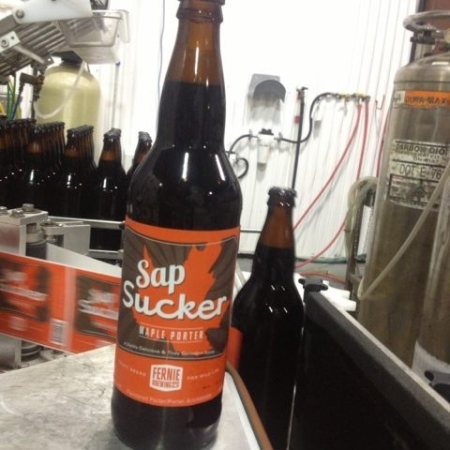 FERNIE, BC – Fernie Brewing is getting set to bring back Sap Sucker Maple Porter for another year. Since it set off on its maiden voyage from the brewery back early December 2010 – perfect timing for December festivities and those thirsty needs that generally accompany the season of good will – it hasn’t stopped. Our deliciously dark & robust Porter, with a delicate but flavourful touch of maple syrup. Favoured by the educated craft beer drinker, looking for a uniquely rich & flavourful product, it’s popular with consumers, beer bloggers & judges! This year’s first batch of Sap Sucker was packaged last week, and will be available soon in 650 ml bottles at select liquor stores in BC and Alberta.